Apparent student punk in Kenosha. I can understand the driver defending himself, but at the same time, my gut feeling is that he got fired because he didn't put the parking brakes on, causing the accident. Right. I'm actually surprised no one picked up on that. Everyone commenting on the article were ticked off with the kid with good reason, but they let that anger with the kid blind to the fact that the driver didn't bring the bus to a complete stop, from what I could tell, nor engaged the parking brakes as you pointed out. The kid though is facing the right punishment because what if he'd had his little hissy fit and thrown that punch on the driver while the bus was in heavier traffic? The situation could have been worse. The article mentioned that among the initial charges were larceny, grand theft auto and manslaughter for the death of the bus driver. It sounds to me like this guy did some heavy partying and after already getting kicked out of a couple of places already, went into an alcohol induced tantrum, in part because of his age and a sense of entitlement from his uncle's celebrity status, and stole the delivery truck which he ended up slamming into the bus. The article had mentioned he was kicked out of a club earlier that night and kicked out of a hotel after spending time in that hotel's restaurant and passing out in the hotel lobby. There was also mention that he was upset that a limousine wasn't available at the time he was kicked out of the hotel. Just tragic for not just his family, but also his fellow operators at NYC Transit. Yes that is a sad story. I had other thoughts about it, but those thoughts have no relevance to the unchangeable fact that this poor guy died from the stupid actions of a very immature 22 year old adult. One wonders about the policing of the LIE when viewing the video. How could anyone tow a bus in that manner without being stopped? As they said, similar to Metra, in a Tribune story that an MTA conductor left 500 apology letters for having told passengers to wait on a platform for a following train that didn't show up. Who cares about a New Flyer on Long Island. NY is Nova country!!! Only near Plattsburgh. NYC was mostly Orion VII country, but it recently started to buy NFs, and Orion assigned a couple of contracts to NF. Based on the assigned contracts, I thought it was a CNG, but it doesn't look like one. Given the lack of decals, one would wonder if there is a scrap yard out there. Not so much the photo as the story behind it. 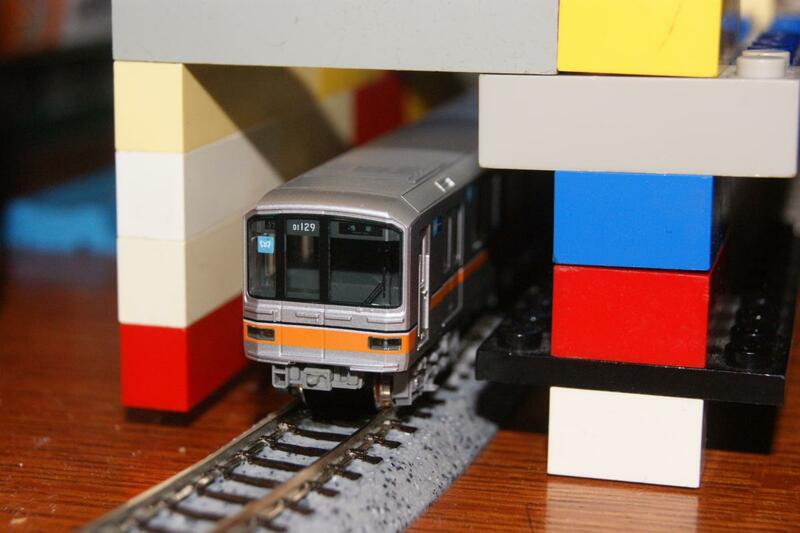 This is a picture of one of my model Tokyo Metro subway sets. I even built it a little subway station. The real ones run on 600V-DC, just like the CTA L cars, but since they have different signaling systems and are longer than CTA cars, they can't run here. I have yet to travel to Japan though. Correct. NYC Transit and MTA Bus (the former NYCDOT private operators) ordered Orion VII in both the old (slanted windows, similar to the Orion VI) and new generation (similar to the Orion VII hyrbids operated by PACE) in both hybrid and CNG models. 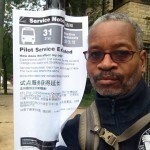 Once Orion went out of business, NYC Transit began splitting subsequent bus orders - both "rigid" (40 foot) and artics - between New Flyer and Nova. If you're talking about the bus that was being towed, it appears to be a 1990s-era C40LF (the first batch of New Flyer low floor buses purchased by NYC Transit). I guess this is Random Russia, a Tribune video about Russian Train Surfers. The passenger train seemed to have an electrical overhead wire, so I guess these don't know about the guy who fried himself at University Park trespassing on top of a Metra Electric train. On that note, I found a video of a guy jumping on a Paris Metro train. No wires, but he could have easily fallen onto the third rail. Also, Russian trains arc pretty badly in the winter, as do many other trains. I don't know the voltage they run on though. Your Attention Please... This Train Is Experiencing An Equipment Problem... Your Operator Is Off The Train For A Few Minutes Working To Correct The Problem.... We Expect To Be Moving Shortly. Rail Operator looks over this situation: "Screw this! They don't pay me enough to be no Thomas Edison!!! Time to radio ahead to shut the line down! Paris just happened to have a corrugated awning over the portal? Despite me being in the appropriate thread, I forgot to mention that my parents almost got pick pocketed on the Paris Metro. The plan was that two people would work together. One would fake a heart attack or something and knock into you to distract you, and the other would do the valuable snatching. From what I've been told, Person 1 brushed into one of my parents, but he did it so poorly that it wasn't more than a comical nudge. Person 2 was quickly exposed. That was in fact a C40LF as both of you suspected and not a DE40LF as sw stated in his post. Researching their fleet NYC's New Flyer LFs happened to be CNGs. The hybrid buses they got were from Orion. Regardless of that fact.... DE40LF or C40LF, I think you have to agree that is not the way to tow a bus, be it an operable or a soon-to-be scrapped bus. I'm baffled as to why if it had to be towed from the rear end, why the front wheels weren't put on a dolly so the bus could be towed in a straight line if there wasn't a way to straighten out the wheels. And how come he wasn't stopped for taking two lanes & driving well below the posted minimum on an expressway? That probably depended on where the bus was parked when the wrecker came to tow it. If it were parked against a building, then the wrecker would have no choice but to lift it from the back, apparently he got it picked up and got it to the expressway with no problem Somehow the ffront wheels of the bus started turning on their own. Calm down dude. It's pretty obvious that's not the way to tow a bus. The larger question is how it got that far down the highway with the bus twisted out of control like that without the driver of the wrecker even making an attempt to stop and without getting stopped by local or state police. Regarding the bus video, which wheels actually get the bus moving, and would that influence how to tow a bus? ...The larger question is how it got that far down the highway with the bus twisted out of control like that without the driver of the wrecker even making an attempt to stop and without getting stopped by local or state police. Good question, and I hope the supervisors for the driver are asking him that.